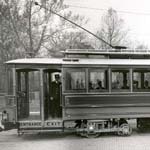 Columbus Railway Power & Light Co. car 590 was one of fifty-two streetcars built by the Kuhlman Car Co. of Cleveland, Ohio, between 1908-1911. It is very typical of the two-man streetcar design preferred by the CRP&L Co. in the first two decades of the twentieth century. Car 590 was a Pay-As-You-Enter car which meant the customer entered the car from the rear and exited either from the rear or front. The conductor collected the fare as the customer entered the car. They had large vestibules which allowed customers to gather around the conductor to pay their 5-cent fare while the motorman moved along keeping the streetcar line on schedule. The interior wood was stained and polished and when new the exterior paint included fancy scroll and trim work giving the rather simple design a mark of elegance. In subsequent paintings the fancy scroll and trim work would not be replaced. The cars always required a motorman and conductor which eventually led to their replacement starting in 1926 with the new 700 series one man cars. Bench seats along the sides of the car left plenty of room for standees. The two benches seated 34 as long as the passengers averaged no more than 16 inches in the beam. It helped that the early twentieth century denizen hadn't yet encountered fast food. Like most CRP&L Co. double truck streetcars they were equipped with Brill Maximum Traction trucks. Each truck held one motor. Columbus did not have a lot of hills to tax the somewhat low power of Maximum Traction trucks. The photo is from the DAK collection and the drawings of car 590 were prepared by Donald A. Kaiser in 2007 working from an original CRP&L Co. drawing and photographs.